Break this page into smaller pieces (Bus Tour, Chandler sites, Jamestown, Shields). 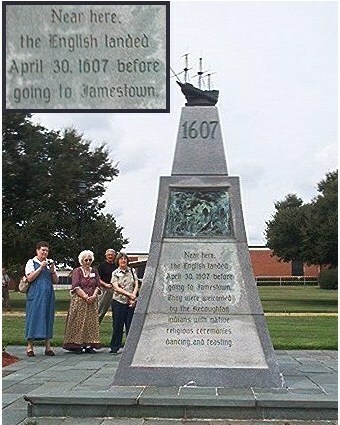 The original settlers of Jamestown were starving to death by 1608/1609. Word of their plight arrived in London, and people who were heavily invested in the settlement got busy planning an infusion of additional settlers and supplies. Nine ships left Plymouth, but the three leaders wrecked on Bermuda in a hurricane, arriving in Virginia May 24, 1610. Seven ships landed in Virginia between August 8 and October 3, 1609, carrying most of the new settlers but with food and supplies ruined. Lord Delaware launched his own expedition, leaving London and then rendezvousing at Cowes on the Isle of Wight. Three ships, including the Hercules, sailed for Virginia on April 1. 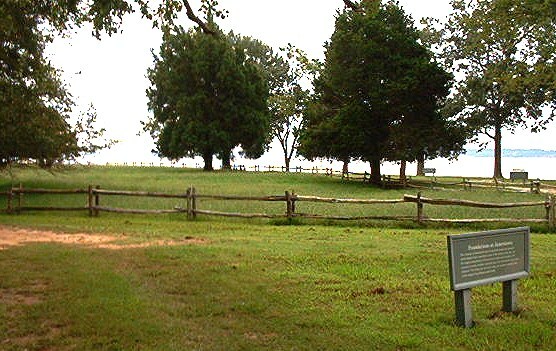 After being separated in a storm, the three ships reunited at Point Comfort, only to learn that the settlers, under the leadership of the newly-arrived Sir Thomas Gates, were on the verge of abandoning Virginia entirely. Lord Delaware overruled that plan, sending word up the river to Gates that he was coming to Jamestown. 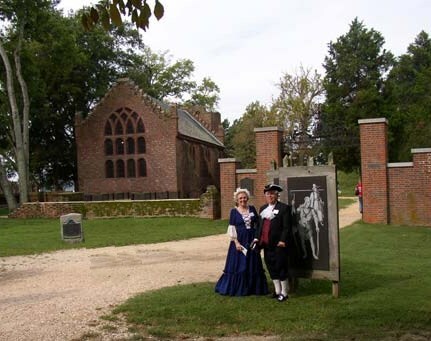 Lord Delaware (and John Chandler) landed at Jamestown on June 10.Memorial Church at Jamestown was built on the site of a 1617 frame church, the third built by the settlers and the first built outside the fort. The first frame church burned in a great conflagration in January 1608. 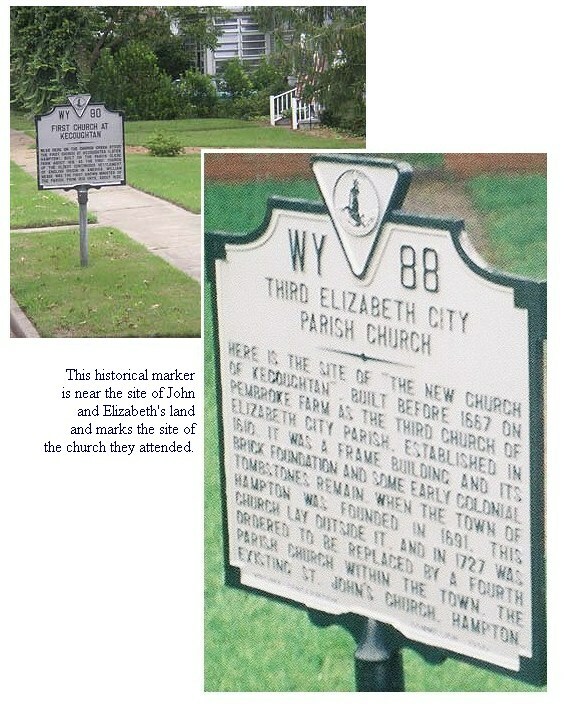 In the winter of 1608 another church was built, and Pocahontas probably was married in that church in April 1614. From Jamestown Church brochure: The frame church built in 1617 is of great historical importance. Within its walls, in 1619, met the first representative legislative assembly in the New World. 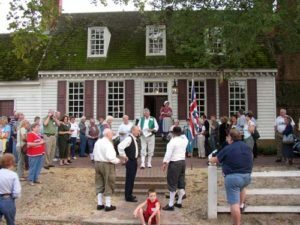 This meeting of elected planters, held July 30 through August 4, set a pattern of self-government for all the American colonies. 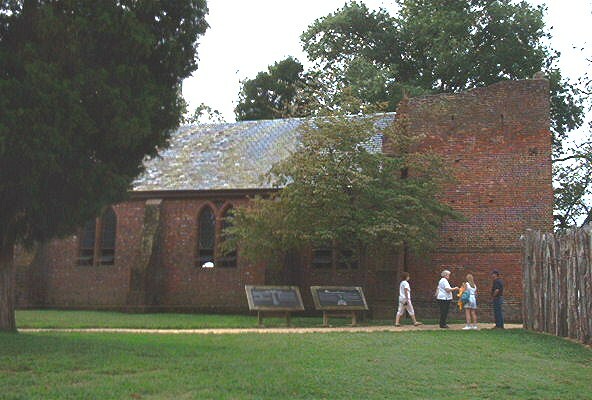 The frame church erected at Jamestown in 1617, where the Memorial Church stands today, served as a place of worship for the colonists until about 1639. At this time it appears to have been razed to make way for a new brick church. The brick church tower, erected after 1647, was an addition to the 1639 church. . . . . 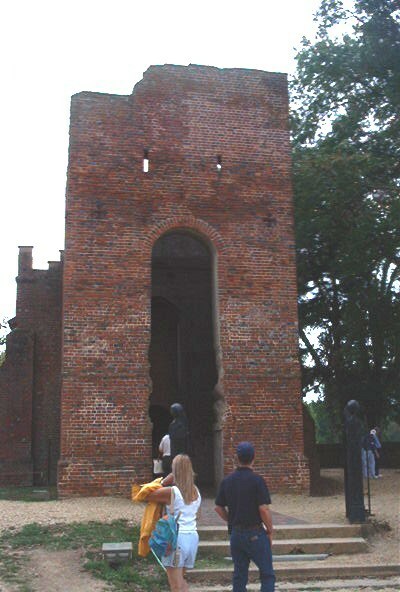 The partially ruined brick tower is of great significance for it is the only 17th-century structure standing above ground at Jamestown today and one of the oldest English-built edifices standing in the United States. * * * * . . . . 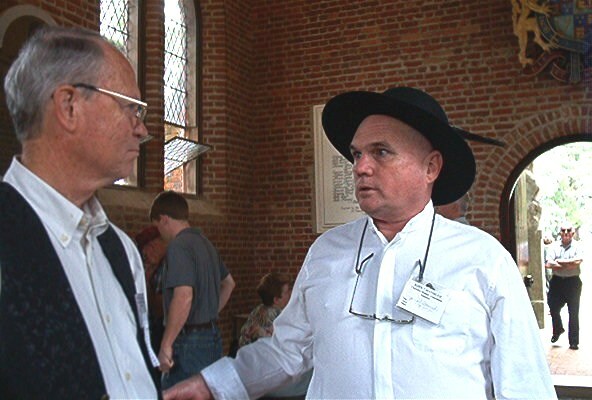 Inside the Memorial Church one may see (covered with plate glass) the brick and cobblestone foundations of the 1617 frame church . . . . Second cousins (once removed) Jerry Chandler and Kirk Chandler, both dressed in colonial costume (sort of) for performing in skits later in the day, meet for the first time in the Memorial Church at Jamestown. 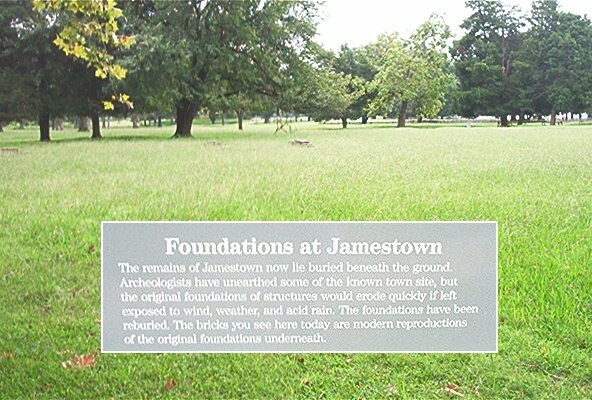 The foundations of Jamestown have been reburied to protect them from the elements. There are some reproduction brick foundations out there in the grass. A view of the James River at Jamestown. 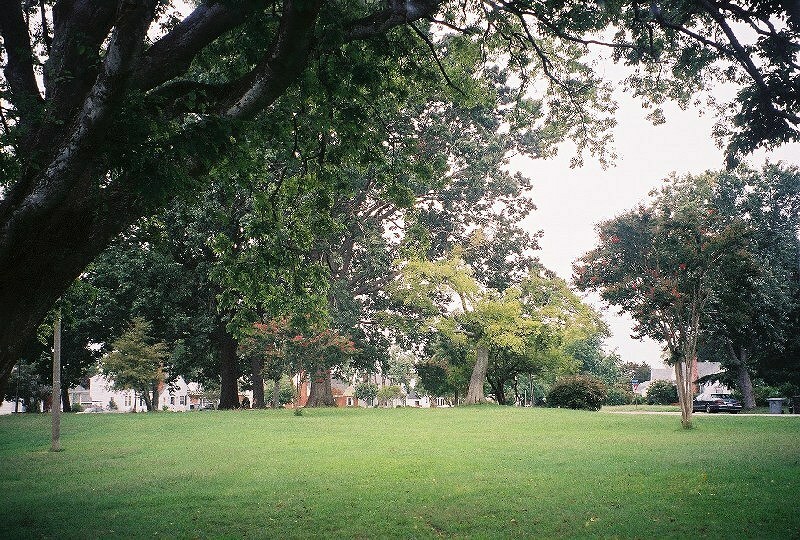 Robinson Park, a small city park, is part of the land formerly owned by Elizabeth Lupo Chandler. Our bus tour circled around through city neighborhoods to circumnavigate both John’s holdings and Elizabeth’s. Traveling along the coast on Chesapeake, you would turn at Robinson Road to get to the park, and you would have all around you the land owned by Elizabeth Lupo Chandler and that designated as Albiano’s on the map, later owned by John Chandler. Albiano was Elizabeth’s first husband. After Albiano’s death, Elizabeth married our John Chandler. 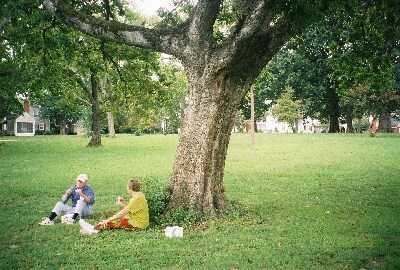 John eventually owned thousands of acres in the Newport News area.The tour stopped for a box lunch at Robinson Park. 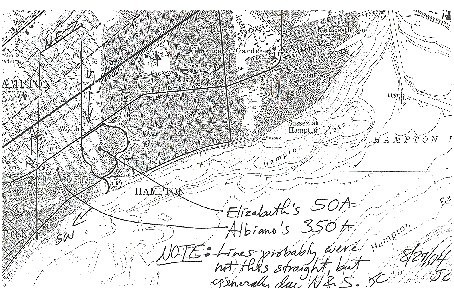 This map detail shows the area designated by Joe Barron Chandler as belonging to Elizabeth and Albiano. Click on this map to see a larger version. 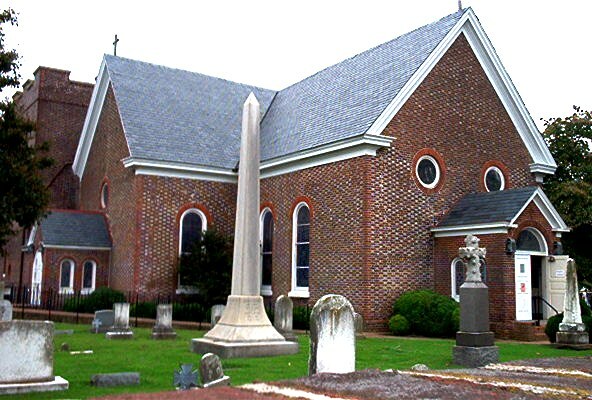 St. John’s Episcopal Church, Hampton, is a reconstruction of the Elizabeth City Parish Church, where members of the Chandler family attended. 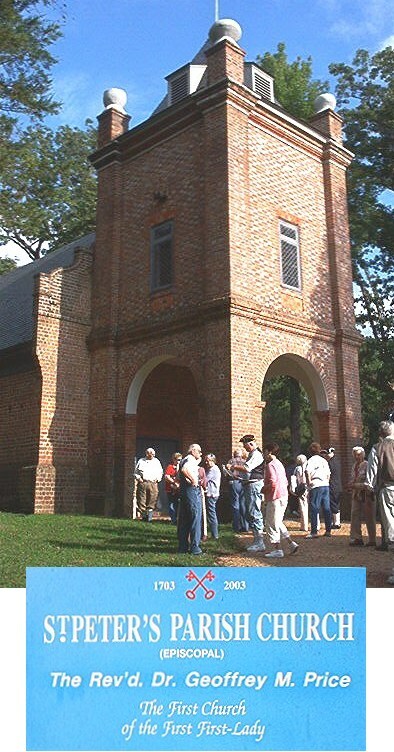 Construction of the Elizabeth City Parish Church was completed by 1728, with a belfry added to the west front in 1762. The church was heavily damaged by the British during both the Revolutionary War and the War of 1812, and American antagonism to anything English contributed to the neglect of the building. In 1825 funds were raised to restore the church and it was reconsecrated in 1830 under the new name of St. John’s. In 1861, to keep the town from Federal hands, the citizens of Hampton set fire to their homes, businesses and the church. The great bell was destroyed, and only the blackened walls remained when Union soldiers camped in the churchyard. 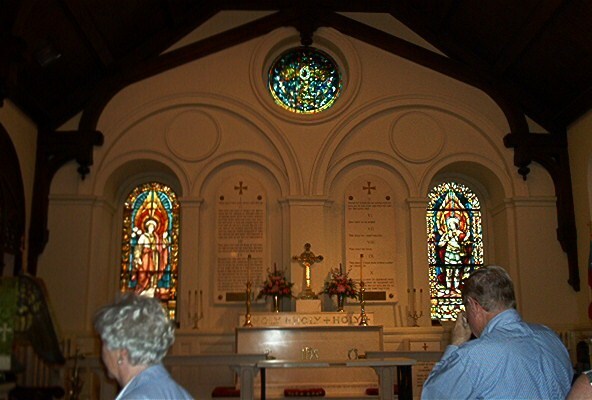 Inside St. John’s Episcopal Church. 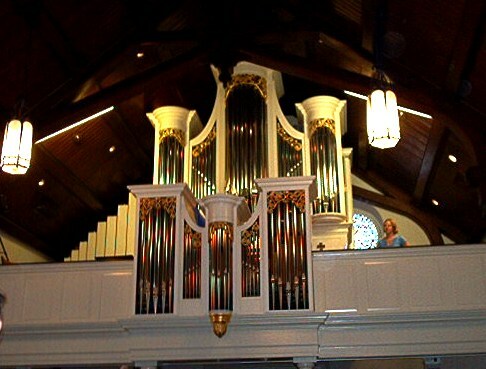 Looking up to the pipe organ loft in St. John’s Episcopal Church. 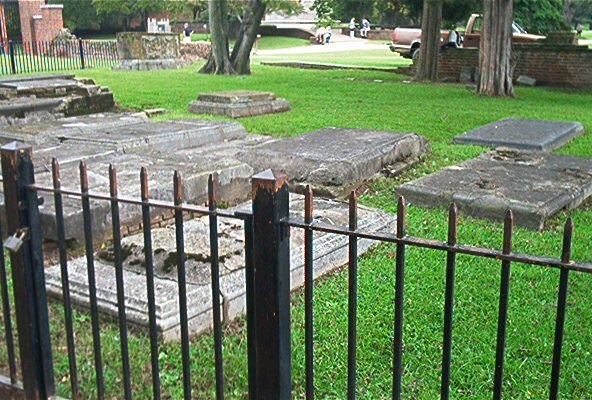 Some of the foundations and also some colonial graves remain from the earlier church. 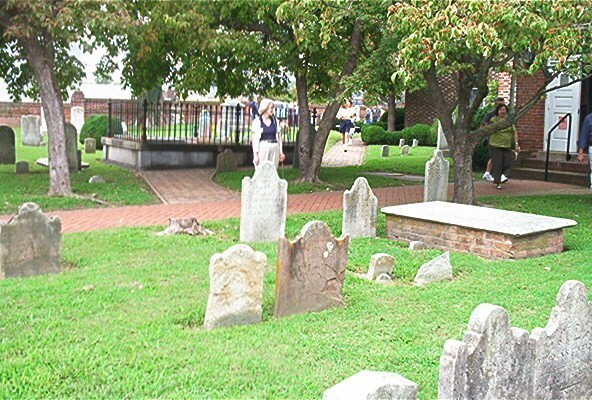 Hannah Chandler, the original John’s granddaughter and a matriarch of the family with a very interesting history, is buried here. From St. Peter’s Episcopal Church brochure: Construction on the present building was begun in 1701, with services first held in the new building by 1703. The unusual ‘stump” tower was added by 1740 to house a bell and provide a meeting place for the Vestry. 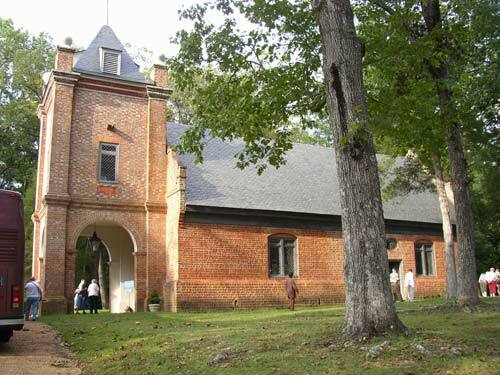 St. Peter’s is the oldest church building of the Episcopal Diocese of Virginia and the fourth oldest church in the Commonwealth. The families of Robert Chandler, Jr., and his son William lived in this area and had children baptized at this church. 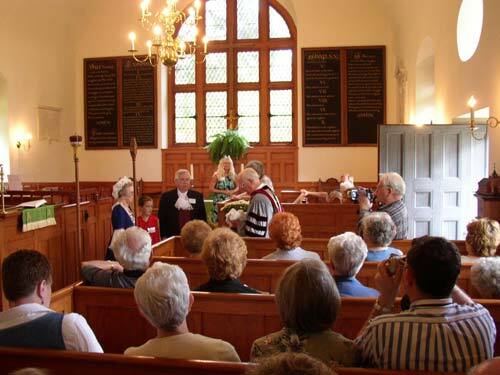 The Chandler Family Players reenacted a colonial baptism at the church for the tour group. George and Martha Washington were married here in 1739, presumably in this actual church building, since it existed at the time.From brochure provided by church: Martha Dandridge, who would become the wife of George Washington, was the daughter of a Warden of St. Peter’s and attended this church when she lived in New Kent. 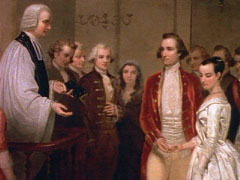 Her marriage to George Washington was solemnized by the rector of this parish, Rev. David Mossom, in 1739. 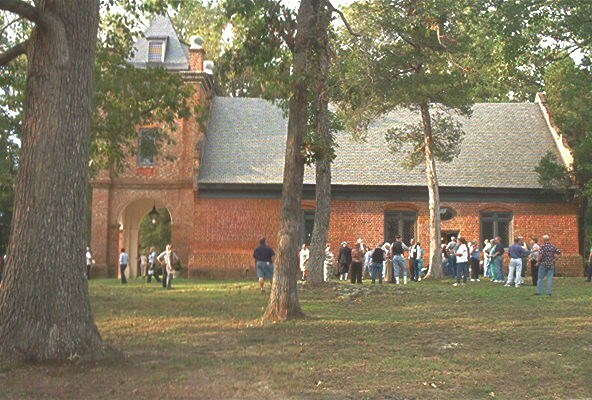 Robert E. Lee, who visited the church many times and took a great deal of interest in its restoration, believed the ceremony took place at St. Peter’s Church. He was married to Washington’s great-granddaughter. 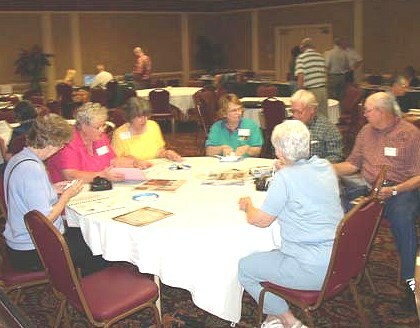 CFA members spent time at the 2004 annual meeting comparing ancestors and doing research in the materials provided by the association and members such as Jim Reeves. 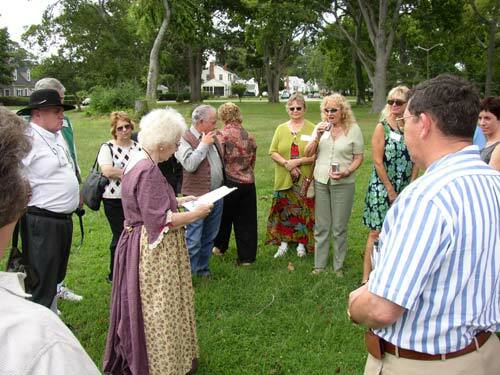 A highlight of this special annual meeting was the bus tour on Saturday of many Chandler-related sites in the Jamestown/ Hampton/ Newport News area. This monument is on the grounds of a veteran’s hospital and was the first stop of the day-long bus tour of Chandler-related sites. The lady in colonial dress is Annamae Chandler, one of our tour leaders. This map in the Hampton Historical Museum shows where the colonial settlers first landed (see the several red dots out on the point – two of the dots later became Forts Henry and Charles, another was called Point Comfort), and where Jamestown is in relation to the first landings. 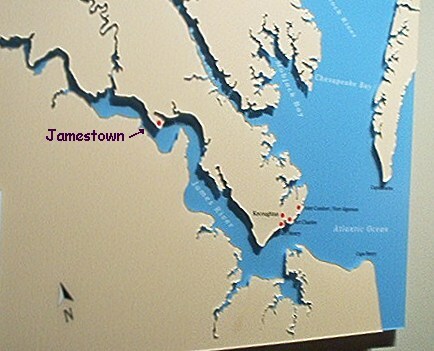 (“Jamestown” and the arrow were added; they are not on the original map.) The settlers were advised not to settle along the coast because they would be attacked by the Spanish. They moved up the river to what became Jamestown, and our John came along a couple of years later. Saturday evening, after the bus tour, our Chandler group had a delicious colonial dinner at Shields Tavern in the historic area of Williamsburg. 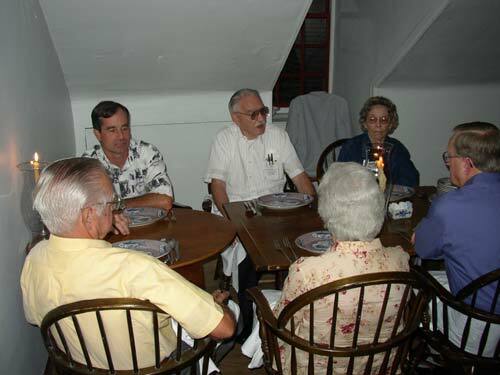 The Chandler Players , in colonial costumes, performed some historical skits before dinner. Vice President Jim Reeves entertains the group at his table at the Shields Tavern dinner.